Andrew spent many childhood hours at Jean's Jungle, a wildlife rehabilitation center run by his grandparents, Jean and Gene Thompson. Over the years, more than four hundred (400!) raccoons resided at Jean's Jungle. Most came as babies and many had to be bottle-fed. Some were named individually, but most came as kits in family groups of two to six and were named as a group based on their origin or circumstances. Ralph, a lifetime resident (9 years) of his own choosing, was Andrew's pal. Ralph loved pizza and pasta of any kind. He loved it when Andrew fed him Fudgesicles! Ralph came to Jean's Jungle quite spoiled by a warden and his sons who had him for the first month of his life. Ralph loved to be cuddled and he was extremely friendly. He lived in the old playhouse, had his own doggie door to an outside play area with a tire swing, a tree for climbing, and a swimming pool. He would often go for walks in the woods with us, but he always wanted to go "home" afterwards. Ralph never missed a free meal! 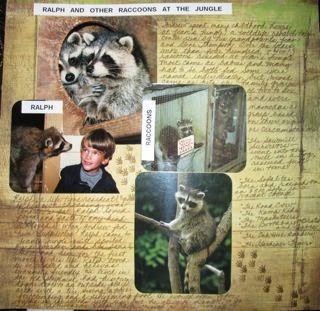 Love the stories of the raccoons and the picture of Andrew with Ralph. 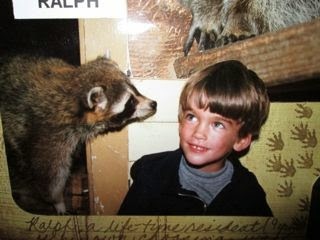 Next time you are over will show you a picture of our Christopher about that age (minus the raccoon, of course) as he looks so much like Andrew!